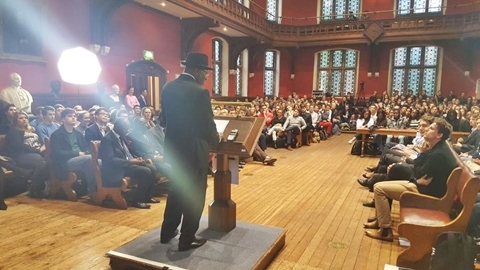 While the former president, Goodluck Jonathan was speaking at the famous Oxford Union in United Kingdom on the subject of promoting youth entrepreneurship, on Monday, he said it was impossible for Sambo Dasuki, the National Security Adviser (NSA) during his administration, to steal $2.2 billion as claimed by the Economic and Financial Crime Commission (EFCC). According to a report by Premium Times, Jonathan disclosed that it was “not just possible” for Dasuki to steal $2.2 billion after his administration procured several equipment for the country’s military. While admitting that corruption was an issue during his administration, the former president said that some of the allegations have been “exaggerated”. The immediate past president however, said that as some of the corruption cases are still in court, he would rather allow the legal processes to reveal the facts of the matter and that he doesn’t want to appear as challenging the incumbent government. “One thing about the issue of corruption is that these matter are in court, let’s allow some of these processes to end. Lately some judges’ (homes) were also invaded. There are so many things involved and we have to follow up these matters to conclusion before we know the fact. He said that allegations of corruption were not unique to his administration, adding that governments have been overthrown in the past because they were accused of being corrupt only for the new administration itself be pushed out of power by another junta touting the anti-corruption mantra. “You will see that it has become a major topic whenever there is a change of government,” he said, and further argued that corruption is a global problem but the perception of corruption is greater in Nigeria due to the Nigerian media obsession with reporting on corruption. “I am not saying there is no corruption in Nigeria, there is corruption. If you look at corruption there is almost no country that is free, the degree varies, the perception varies.